The Gobindgarh Fort –the very symbol of Punjab, the iconic protector of Amritsar is situated right in the center of the Holy City along the Grand Trunk road spanning across 43 acres of land. This magnificent heritage site has a history of its own, spread across a period of over 300 years, right from the times of the Bhangi Misl-Maharaja Ranjit Singh-The East India Company-the Indian Army. This qilla has finally opened its gates for the very first to welcome not only the people of Punjab but also each one of those devotees and tourists that come here to pay their respects to ShriHarminder Sahib. At one time the world famous Kohinoor diamond was housed in here.The qilla is now being restored in a phased manner to hopefully revive it back to its past glory to the times of the Maharaja. Here within the fort are several different buildings, built across the span of time, some during the Maharaja’s reign, such as the Toshakhana, Khas Mahal, Bastions, Moat, Wells, Haveli etc, some during the East India Company such as the Darbar Hall. Some existing structures were altered during the British times and others partially added such as the Anglo Sikh Bunglow. Here there is a bell of 1863 made in Sheffield, UK, which was made in order to cast other bells at that time. SHER E PUNJAB- A glorious history from the past depicted through the means of technology, to entice, enlighten, educate, enthrall and inspire. A 7D show based on the life of Maharaja Ranjit Singh that transports you back to the 19th century in an immersive way leaving you enchanted and is aptly called Sher e Punjab. TOSHAKHANA-COIN MUSEUM- The Toshakhana, which once stored the coveted Kohinoor diamond is now a coin museum for old and rare coins including a replica of the Kohinoor as it was worn by the Maharaja. The circular structure of the roof that was made by the use of the original nanakshahibrick is intact till date and quite awe inspiring. THE BUNGLOW–ANCIENT WARFARE MUSEUM- The grand building of the Anglo Sikh Bunglow has now been converted to an Ancient Warfare museum and today has several replicas of instruments and attires of warfare. It has many real, lifelike figurines that are so realistic they seem they would come alive if touched. SPIRIT OF PUNJAB- A stage that keeps the fort alive all day long with live performances of bhangra, gatka, gidda, comedy, games, dholi etc. Several prizes are here to be won each day. AMBARSARI ZAIKA- People here engage themselves in the various food shops and stalls that offer the choicest of Amritsari and Punjabi cuisine alongwith some other eatery options as well. HAAT BAZAAR- You can feast your eyes as you roam the well located Haat Bazaar,that offers fares right from phulkaris, juttis, shawls, antiques etc. for you to purchase from. WHISPERING WALLS- Kanda Boldiyan Ne or Whispering Walls is a show using state of the art projection mapping technologies and laser lights. A show of this quality has never before been seen pan India and we can certainly state that it will surely take your breath away. This show is held every evening post sunset. There is a Punjabi as well as an English show each day. There are several other activities to entertain and keep the old and young occupied, such as horse rides, camel rides, horse carriage, trampoline, rock climbing, etc. Wow!! What a unique and splendid way to revive the history of this great fort. Pets are not allowed in the premises of the fort. Call for inquiry before paying a visit to the fort as it may be closed for renovation. Visit the fort during the day. Ticket prices and timings are not available. Entry ticket: 35 INR, for rest attractions and shows separate charges applicable. How popular is Gobindgarh Fort? People normally club together Lal Mata Temple and Pul Kanjari while planning their visit to Gobindgarh Fort. This fort has been restored to its olden glory. A must to visit this fort. It has a great mix of technology n history. 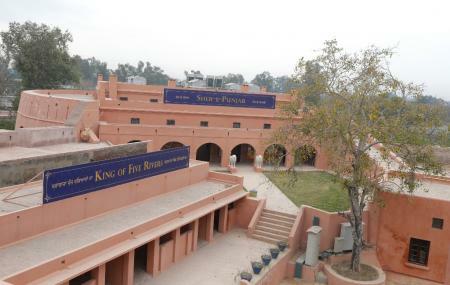 There is a 7D show of Sher e Punjab that covers the life history of Maharaja Ranjit Singh and is a must see. There are 2 museums here which have rare coins, warfare instruments, Kohinoor replica too. There are loads of food options to pick from giving the best of Amritsar. Shopping here too is fun. There are several fun activities, live Bhangra, local martial art etc on their stage. The evening show which they call Whispering Walls is by far the best show that I have seen in India. Would certainly rank it #3 tourist attraction in Amritsar, third only to Golden Temple n Wagah border. Surely a great edutainment for the entire family filled with fun. This is really a good spot to visit in Amritsar. The tickets were a bit expensive. They have the museum which has mannequins of all the warriors. The mannequins are made of silicone, it really looks real. You can notice the detailing done, it's really amazing to see. They also have the laser show where the Gobindgarh for narrates the story of itself in Punjabi and then English. You can't miss the 7D show, you will see the whole story of the king Ranjit Singh. The food stalls are also good. A wonderful experience and a pack of knowledge. Live show plus laser light show were great. But tables plus area in food court let us down. Hope there will be some improvements next time. Overall a good visit. This place deserve 5+ stars. If you want to spend a day out with your family in Chandigarh with a limited budget then this place is actually for you. You'll get food and fun for whole day just for a nominal price(according to their plans and combos). I strongly recommend this place. The warfare museum is a must see. The wax mannequin is so real. The place has good options for dining as well. The sound and light show is good as well. Nice place to spend an evening with family.